I am vexed. I've visited sixteen stores in Texas this week and have yet to find pool noodles worthy of a gentleman's battlefield. However, I fear the pungent zephyr of white trash and Little Debbie snack cakes will forever permeate my wailing soul. Still, onward I march . . . I'm comin', Phibes, and hell's comin' with me, pinkies raised . . . Hoping to be in an actual Big Lots or two this weekend, but I've no doubt I'll be late to the shindig now that it's become an official sport. 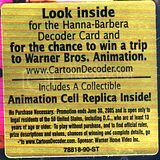 Some copies of Flintstones S3 have a gold sticker on the packaging indicating a Decoder Card and Animation Cell Replica are inside. Do other seasons have these? How many cell replicas were made? Last edited by cracksky; 07-24-09 at 12:06 PM. I had no idea until you posted this, but I just checked my haul from yesterday and my copy of Huckleberry Hound has a similar sticker promoting a free cel. Maybe that's why so many seasons are not sealed. The "Cell's were removed". Did everyone's Popeye Vol.1 have a sticker that said "Bonus Inside: Exclusive Reprint of a Vintage 1936 Popeye adventure comic book"? I haven't opened it yet, but was just curious if everyone's copy had this. Yeah, but instead it was a coupon for Popeye Spinach. I wasn't able to pick up any duplicates because there were three or four other guys crowding around the displays, pushing each other out the way and picking up multiples of almost everything. (Some guy had AT LEAST 10 copies of Flinstones season one!) I grabbed what I saw that interested me and got out. I am going to try and hit the same Big Lots tomorrow around opening and see if they have restocked anything. I'm still looking for seasons 2, 6, and 7 of Tales from the Crypt, Space Ghost & Dino Boy, and Powerpuff Girls: 10th Anniversary. Last edited by PopcornBandit; 07-24-09 at 12:35 PM. I got a Flintstones s3 yesterday with that sticker, and the Huckleberry Hound I got monday has it too. I'm also curious if any others have the cell included. Yes, mine had the comic book inside. Some folks had only a coupon inside, while others had nothing inside. You can kinda "feel" if the comic book is inside. The Popeye set is constructed in this manner: Outside is a boxset style cover with the opening on the side. Inside the 4 discs are held by 2 clear digipaks (2 discs overlap each other on each digipak.) with a third flap for some episode listings. When folded up and inside the boxset cover, the set has a slight "firm" or "full" feel in terms of thickness if it has a comic book inside. My had comic book inside it's so cool! Hallelujah! After I indulged in a bout of self-pity this morning, I decided to try one more time. I came back from south Huntsville with TWELVE boxsets! North Huntsville has gotten some restock, but nothing notable. Maybe, just maybe, I'll find some more of those Hanna-Barbera sets showing up around here. Did anybody find Smallville Blu-rays other than season 7? Little Debbie snack cakes are as addictive as the search for the elusive Looney Toons box set. I'm heading to scope one out after work since sadly I was otherwise occupied at luncheon. However, I'm concerned for my sanity since I've taken to going to BL at lunch and after work on a daily basis twice now. I just hope I can procure what I'm hunting for (have no hopes of Tunes set, but hopeful) and some other studio doesn't dump a ton of stuff at BL. There should be a twelve step program for BL addiction... and Little Debbie snack cakes. First I'd like to say that I am not a re-seller and have never sold a dvd. Yesterday I was in my local BL and picked up an extra copy of Lois and Clark Seasons 1 and 3. Haven't seen a lot of resellers in my area so the local FYE may not be flooded. I'm looking to finish out part of my dvd collection and would rather trade than drop $40 on amazon or ebay. The Complete Roots box set, a very large box containing original Roots Series, Roots the Next Generation, extras and a book, for $10. On the very top shelf of the aisle containing DVD's, not the 4-sided island display. The island display had several Smallville season 7 Blu-Ray sets. Both stores had Popeyes, Flinstones, small quanities of other H-B animations, I scored a Pinky & the Brain set, Adv. of Superman TV , second season and seasons 3&4 sets, but low in quantity. I am hoping both stores will put out more tomorrow, but could depend if they have shelf space to do so. I'd love to find Bond movies! If someone finds goodies at the Plainfield store, please post, have not been there yet. I stopped by the Polaris BL and they had LOTS of "Popeye, Volume 1" and the first 3 seasons of "The Flintstones". There were a few "Top Cat" sets and about 3 "Wacky Races". The Morse Road location had zilch but one of the managers was telling a drone to clean out a side of the wire rack to put in some new stock. I asked when they would be put out and she said she wasn't sure if they would be put out before Sunday or not. I was excited to pick up the Agatha Christie 3 Movie Collection Box Set Featuring Helen Hayes for $3. Has anybody spotted the companion set, The Agatha Christie 3 Movie Collection Featuring Peter Ustinov at a Big Lots? I hate to break it to ya but FYE is wise to people trying to buy them at Big Lots and turn them in for "extra" credit. Just search some of the posts/threads here and you will see for yourself. You might be lucky if you got anything from a few cents to a few dollars if you were very lucky. Edit: You should have picked up some of those extremely rare Joey S1 sets!!!!! All the major trade-in spots are wise to the goings on at Big Lots. The best you can do is trade-in one copy only of certain items to DVDPlanet for store credit, but at a fairly low profit margin for most titles. I forgot to say that you should have bought Joey Season 1 because I heard it is going for $100 on eBay right now. Yes, I traded a S6 in the exchange forum. They are/were out there but very rare in comparison to S7. There was one S6 in the box here and about eight of S7. In my opinion, the window has closed on that batch of season sets though... Especially now with the resellers scooping up everything in sight. I'm heading back out to see if any of the three Big Lots here have restocked anything. If I find any of the Looney Toon sets I'm getting one for myself and I'll pick up anymore I can get my hands on, then post on here for a trade or just sell to person that hits me up first. I'll also try to see if I can find or piece together a full set of The Flintstones and Tales from the Crypt and post here, since it seems people are having problems finding all the seasons.